My kids love all the products from The Pencil Grip, Inc., so they were thrilled when we were asked to review a 24 pack of Magic Stix Washable Markers. Magic Stix Washable Markers are neat. They don’t dry out as quickly as regular markers. In fact, you can leave the lids off for up to seven days and they still work. We tested it. Well, not on purpose. But, marker lids always seem to disappear around here. Or not get snapped on tightly enough to close. The ones without lids did continue working for the full seven days. I was impressed! These markers are also odorless, non-toxic, and washable. This set includes 24 markers in a variety of colors. There are several shades of the main colors, plus plenty of other options. The kids never complained that they needed a different color, because there were a ton of options. The case is my favorite part. It closes tightly enough that my three-year-old can’t open it on her own. Which is a good thing, because she isn’t old enough to use markers without supervision. She likes to make all sorts of things pretty, especially herself and the floor. 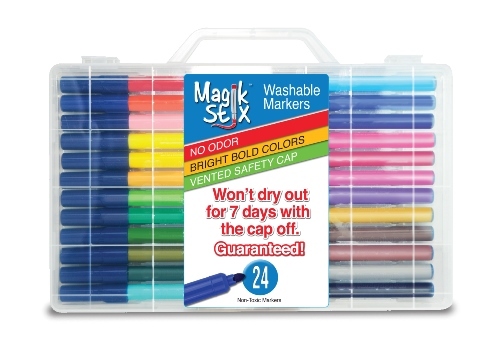 During the review period, the Magic Stix Washable Markers got almost daily use. They last for a lot of coloring. Here’s Simon squishing himself into his race car. He doesn’t always take a ton of time with his coloring, but he sure has fun doing it. Here’s a coloring page Simon completed with the Magic Stix Washable Markers. This one was part of “school time” so I required him to do a better job on his coloring than he would do without encouragement. As you can see, the colors are bold. The markers work well, have true colors, and last a long time. They are a great addition to our Family Coloring Box. Many of the kids used them during Family Writing Time to help create projects. Others asked permission to use them during Quiet Time. The older kids liked this, because then they got them all to themselves and didn’t have to share. What Did We Think of the Product? Here’s a picture of Jeff and Ellie with the markers the day they arrived. I let them open the package, and they were so excited! The kids all approve of these, and so do I.
I like how they feel when you hold them, and how smoothly they put down the color. I’ll be buying more of these when these ones finally run out of ink. They are our family’s new favorite marker! To read what other review families thought of Magic Stix Washable Markers, please click on the banner below.